Calendar Change: The Fall 2005 Academic Calendar (including Final Exams) has been revised to recover Monday classes missed during univeristy closures caused by Hurricanes Katrina and Rita. The University of Louisiana at Lafayette has several ongoing efforts to help displaced students affected by Hurricane Katrina. Keep checking this page for news updates and ways to donate. Graduate students who are displaced from the affected parishes, who need information on enrolling in classes should contact the Graduate School Office in room 332 Martin Hall or call 482-6965. Many current UL Lafayette students from New Orleans and other areas of South Louisiana and the Gulf Coast suffered damages from this disastrous hurricane. The UL Lafayette Foundation's Hurricane Katrina Student Relief Fund has been established to help these students. All donations to this fund will directly assist students who have been affected by this catastrophic storm. The University of Louisiana at Lafayette will offer a mini session due to the influx of students displaced by Hurricane Katrina. The session will start Oct. 3 and end on Dec. 2. • students who were enrolled and in good standing at four-year colleges in the affected parishes of Hurricane Katrina at the beginning of the current (Fall 2005) semester. These parishes include St. Bernard, Jefferson, Orleans, LaFourche, Washington, Plaquemines and St. Tammany. • UL Lafayette students whose primary residences are in parishes affected by Hurricane Katrina. These parishes include St. Bernard, Jefferson, Orleans, LaFourche, Washington, Plaquemines and St. Tammany. • members of the Louisiana National Guard’s 256th Brigade. The Office of Admissions began accepting applications on Sept. 19 in room 336 of Martin Hall. Students may enroll in courses totaling up to 10 semester hours. With special permission from the dean of their college, some students may be allowed to carry as many as 12 hours. Biology 121, Biology 410, Physics 207, Mathematics 105, Chemistry 107, Criminal Justice 101, Psychology 110, English 101, English 102, English 204, Political Science 110, Political Science 317, History 221, History 307, Music 300, Music 481, Theatre 111, Theatre 341, Design 311,	Visual arts 309, Engineering (research experience courses),Business Law 310, Business Systems and Technology 205, Economics 300, Management 230, Sociology 100, Sociology 241. For information on the courses listed above, consult the University catalogue or the online catalogue at http://bulletin.louisiana.edu/UN/82/ . Please note that the individual courses listed will only be offered if there is enough enrollment within each class. In addition, courses of independent study and special research projects will be offered in the different colleges. Courses will be taught by displaced faculty from other colleges as well as current UL Lafayette faculty who have volunteered their time. Displaced students can also enroll in online courses. The SLOAN Foundation and Southern Regional Education Board are teaming up to offer free online courses to displaced students. These courses will be offered beginning in October. Visit www.sloansemester.org for more information. For more information about UL Lafayette's compressed session, call the Office of Enrollment Management at (337) 482-5912. 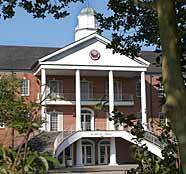 The Continuing Education Program of the College of Nursing and Allied Health Professions of UL Lafayette will present a series of 9 continuing education programs each year. Each program provides 6 CEs, which you may need to renew your license. The college is offering displaced RNs a free registration for either the October, November, or December programs. This is a $70 value. Registration is required, bring your driver's license as proof of your previous address in the evacuated areas. Call the College of Nursing, at 482-6682 and speak to Diana in Continuing Education for dates and titles of the programs. Students who suffered personal property loss as a result of Hurricane Katrina are encouraged to register their losses individually with FEMA by calling 1-800-621-FEMA or logging on to www.fema.gov. Students displaced by Hurricane Katrina should contact the Office of Enrollment Management for universities in Louisiana still capable of accepting displaced students. Dean Dan Rosenfield has informatioin on further options. He can be reached by phone at (337) 482-5912 or by email at dan@louisiana.edu. In addition, more information on these universities can be found on the Louisiana Board of Regents website at www.regents.state.la.us. A campus campaign to raise money for United Way is under way at UL Lafayette. Making a contribution is of particular importance in the aftermath of Hurricane Katrina. Currently, displaced residents are receiving care from American Red Cross, one agency supported by United Way. Other agencies like FoodNet, 232-HELP, 211 and the Salvation Army are also helping evacuees and are depleting their resources. Supplies need to be replenished to help with evacuees' needs along with residents of the Acadiana community who rely on support from the United Way. The extensive services of United Way reach citizens of diverse ages, educational backgrounds, and economic conditions. Through its 30 different agencies, United Way lives its mission of filling people's needs when government and family support cannot. Make a contribution today to the campus campaign. Complete a pledge card and begin making a difference. Call 482-6397 for more info on the campus campaign.